Mix butter and sugar together, then combine the yolks and finally the flour with the flavours. Knead thinly the short pastry and line in a cake-tin. Bake at 180°C. Heat the milk with half the sugar; when the mixture is hot combine a part of it with the flour, taking care of not forming lumps. Cook up to 95°C, then put the beaten yolks with the remaining sugar, finish cooking and reduce the temperature. This recipe is fit for the pasteurizer. Whip well the eggs with glucose, sugar and honey. When the mixture is whipped, combine the yolks and finish to whip. Sift the dusts and put them gently in the mixture. Bake at 175°C, for 30-35 minutes. Place on the cooked short pastry a layer of custard up to half the height, then place a sponge cake disc, of the same measure of the cake; wet with fruit juice. 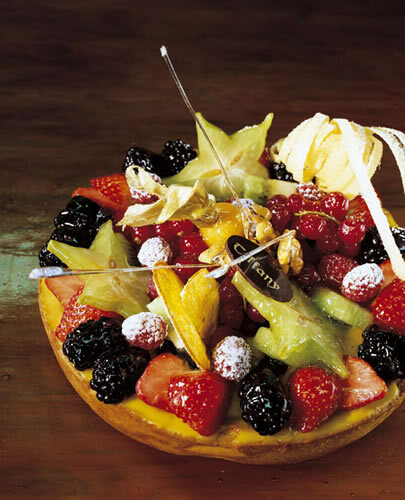 Cover with custard and fresh fruit as you like. 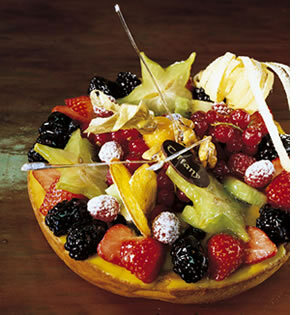 Distribute a thin layer of gelatine and give the finishing touch with a dust of icing sugar, or leave the tart as it is.